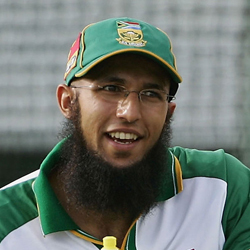 Hashim Muhammad Amla (born 31-Mar-1983; Durban, Natal Province) is a right-handed batsman and an occasional right-arm offbreak bowler, who plays international cricket for South Africa. He made his International debut in Test against India on 28 November 2004 at Eden Gardens, Kolkata. 29-May-2017: Hashim Amla became the fastest batsman to complete 7,000 career runs in 150 innings, eclipsing the record previously held Virat Kohli. 25-Oct-2015: Hashim Amla became the fastest batsman to complete 6,000 career runs in 123 innings, eclipsing the record previously held Virat Kohli. 16-Jan-2015: Hashim Amla became the fastest batsman to complete 5,000 career runs, eclipsing the record previously held by Sir Vivian Richards and Virat Kohli. 08-Dec-2013: When Hashim Amla reached 59 in his 100-run knock in the second ODI against India in Durban, he became the fastest batsman to complete 4000 ODI runs. 04-Feb-2013: South African Hashim Amla became the first batsman since Ricky Ponting to head both Test and ODI rankings at the same time in the latest ICC charts. 28-Aug-2012: Hashim Amla became the fastest player to 3,000 ODI runs during the course of his 150 against England in the first ODI in Southampton. 22-Jul-2012: Hashim Amla (311*) became first South Africa hitting a triple century against England during Day 4 of the first Test at the Oval. Previous highest records made by AB de Villiers (278*) against Pakistan at Abu Dhabi. Hashim Amla became the quickest batsman to score 2000 runs in ODIs. He reach this landmark with an average of 56.66 in his 40 innings (41 matches) for South Africa.